Ron Paul introduced a bill that would require the Fed to manually audit every U.S.-owned gold bar. WASHINGTON (CNNMoney) -- With the price of gold at record highs, presidential candidate Rep. Ron Paul wants to make sure the U.S. gold bars at Fort Knox are really there. Paul called a congressional hearing Thursday to grill federal officials about his bill to audit and inventory all of the gold reserves at Fort Knox, Ky., West Point, N.Y., and Denver, even though Treasury officials insist that the gold is audited annually and is all there. During the hearing, Paul suggested that the Federal Reserve of New York, which has 5% of the U.S. gold reserves, has the ability to secretly sell or swap gold with other countries without anyone knowing. 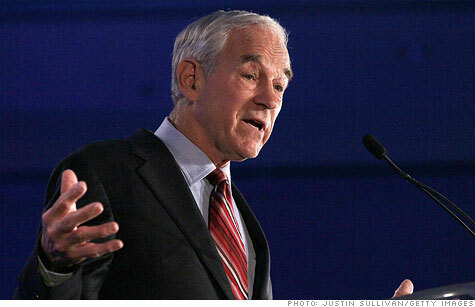 "The Fed is pretty secret, you know," said Paul, who leans Libertarian. "Congress doesn't have much say on what's going on over there. They do a lot of hiding." "This is one of the few legitimate functions of government: To check our ownership and be fiscally responsible and find out just what we own and whether it's really there," said Paul, who is among those running for the Republican presidential nomination. Audits by the Treasury Department and Government Accountability Office are based on samples. Paul wants to open up Fort Knox and other reserves and count the bars manually. "We know where it is. We know how much there is. We know it's there. None of it has been removed," said Treasury Inspector General Eric Thorson. In September, Treasury completed its latest audit, showing that U.S. gold reserves total 9,300 tons with a market value of $320 billion, Thorson said. The recent run-up in gold prices -- the precious metal is trading at about $1,515 an ounce -- puts the market value at $340 billion as of Wednesday, according to Thorson's testimony. He added that each gold bar weighs about 27 pounds and is worth around $500,000. Thorson said Treasury doesn't believe that anyone, including the Fed, has taken the gold or laid claim to U.S. gold bars. Any further audit as proposed by Paul's legislation would be redundant, he said. "There is no movement. There is nothing there that can happen, once those doors are sealed," Thorson said. "It's very obvious if those seals are ever broken." Part of the expense would be due to the bill's requirement to "assay" all the gold, said Gary T. Engel, a director of Financial Management and Assurance at GAO. Assaying means drilling little holes in all the gold bars in order to test its purity. But that process is "basically destroying whatever that piece is." Finally, Engel cautioned, "There will be some loss of the gold from the bars through the assaying process if you do that for every single bar that's out there."